"Our next session will be on January 21, 2017 starting at 8:45 AM at the LDS Church, at the corner of Hazel and Cherry Ave in Orangevale, CA." On September 12, 2016 the US House of Representatives unanimously passed the "Amateur Radio Parity Act" to protect the rights of Radio Amateurs. The bill died in the Senate due to the intervention of only one member, Sen. Bill Nelson (D-FL). ARRL will continue pursuit of the Amateur Radio Parity Act in the 115th Congress. Frank Reshke, N6SNO, has announced his intent to resign his appointment as Sacramento Valley Section Emergency Coordinator effective December 31. We sincerely thank Frank for his long dedicated service in that capacity. Greg Kruckewitt, KG6SJT, will assume duties as our Section EC in January 2017. Thanks to all who participated in the Annual Pacific Division Leadership Meeting held in Livermore, CA on Saturday, December 3. Here are a few updates from the meeting. HR 1301 (The Amateur Radio Parity Act) At the time of the meeting we had received 40,000 responses in the final drive for Senate passage of HR 1301 during the Lame Duck session before Christmas recess. Update: Despite its unanimous passage by the House of Representatives, the bill died in the Senate due to the opposition of one man, Sen. Bill Nelson of Florida. ARRL will continue pursuing passage of this important legislation in 2017. Action on RFI Complaints: Submit these with all documentation to ARRL EMC Engineer Mike Gruber mgruber@arrl.org who fowards them to the FCC. Special Counsel Laura Smith issues letters of notification to the identified responsible RFI generators. The FCC does not send updates to those who file complaints due to privacy regulations. Photos: 1. At the ARRL Pacific Division Leadership Meeting, (left to right) Yuba Sutter ARES EC Steve Sweetman K6TAZ, ARRL Pacific Division Director Bob Vallio W6RGG, and Yuba-Sutter ARC President Chris McLain KK6VZD. Photo by Carol Milazzo, KP4MD. The Amateur Radio Parity Act died in this Congressional session. ARRL will work to introduce this important bill again in the new Congressional session. I sincerely wish you all a very Happy Holiday season! The annual Youngsters on the Air (YOTA) event takes place during the entire month of December, with YOTA stations attempting to contact many other young radio amateurs around the world. The event offers an excellent opportunity for getting radio amateurs in their teens and early 20s to get together on the air. This is not a formal contest but a way to get young people on the air with their peers. Numerous participating stations, primarily in Region 1, will be sporting YOTA call sign suffixes. The annual SKYWARN Recognition Day (SRD) on-the-air activity will take place Saturday, December 3, from 0000 until 2400 UTC (starts on the evening of Friday, December 2, in US time zones). property during threatening weather. During the SKYWARN Special Event, hams will operate from several NWS offices. W1AW will take part in the event. The object of the event is for all participating Amateur Radio stations to exchange contact information with as many NWS stations as possible on 80, 40, 20, 15, 10, 6, and 2 meters plus 70 centimeters. Contacts via repeaters are permitted. Stations will exchange call signs, signal reports, locations, and a one or two-word description of the weather at their respective locations (e.g., "sunny," "rainy," "partly cloudy," "windy"). NWS stations will use various modes, including SSB, FM, AM, RTTY, CW, and PSK31. While using digital modes, special event stations will append "NWS" to their call signs (e.g., N0A/NWS). Event certificates will be electronic and printable from the main website after the conclusion of SRD. An online submission form is available to submit your log summary for SRD at, http://www.arrl.org/srd-form . A webinar will be offered on November 30 at 0100 UTC (the evening of November 29 in US time zones) in advance of the 18th SKYWARNRecognition Day (SRD) on December 3. Register for the webinar online at, https://attendee.gotowebinar.com/register/7546142194155183873 . Do you plan an NPOTA activation in our section? Send e-mail to kp4md(at)arrl.org for posting on this page. We are planning on doing two days but we are not sure if we are going North or South. It will be during the Thanksgiving week. If we go South it will be Kings Canyon, Sequoia and Yosemite. If we head North it will be the Lava Beds at the petroglyphs and the Tule Lake Segregation Center. Don’t forget to get out there and get your NPOTA contacts and do an activation if you can. I will also be willing to do any awards if needed…………. Because of the grandkids I will not be doing awards applications during Christmas time, about two weeks before and two weeks after. Merry Christmas to all and have a Happy New Years……………. Update October 12, 2016 - The ARRL and the FCC are currently working together to update and to make changes to the Official Observer/Amateur Auxiliary program. Because of these expected upcoming updates and changes, ARRL has placed a moratorium on applications for new Official Observers and Official Observer Coordinators at this time. The 34th California International Marathon (CIM), hosted by the Sacramento Running Association, drew over 9000 runners for this 26.2-mile race from Folsom to downtown Sacramento and an additional 3,500 runners for the Relay Challenge. The CIM is a recognized qualifying race for the Boston Marathon. Thirty five amateur radio operators from multiple counties in Northern California worked together to support communications for this event. The Amateur radio communications teams were directed by Sacramento Valley Section Emergency Coordinator Frank Reshke N6SNO who was working his 29th CIM run. The ham radio operators provided communications between the seventeen Aid Stations, three Relay Locations, and SAG buses. They passed lead runner information as well as coordinating the tracking of runners who dropped out and needed rides to the finish line, and passing Aid Station requests for needed materials, and safety concerns. Ham operators also used fire department 800 mHz trunked radios to communicate with Command. The 800 mHz radios were used to pass medical information from Aid Stations to the fire department personnel in the Mobile Incident Command Center communications trailer for dispatch of medical assistance. Thank you to all the radio operators for volunteering their time to make this event a great success. On November 30th Sutter Roseville Medical Center held an Active Shooter Mass Causality Incident Drill. Placer County ARES along with help from Yolo and Sacramento ARES participated in the drill. The drill involved 3 shooters and a bomb vest, there were 22 drill victims. The hams passed traffic between Sutter Roseville and Sutter Auburn. Both voice and digital modes were used successfully. In the lesions learned the hams found that hand held radios cannot transmit out of the concrete buildings within the Sutter Roseville campus, not only did this affect ham communications but it also affected the SWAT teams communications. Thanks to KG6LSB, N6DPH, KG6SJT, W6TOC, N6CKV, WU6X, NI2U, and Michael for participating. ARRL Life member Norm Brooks, K6FO passed away on Tuesday, November 22, 2016. His 100th birthday was on June 1. Among his many accomplishments and interests, Norm earned DX Century Club and Worked All States awards, and operated 160 meters through 70 cm. 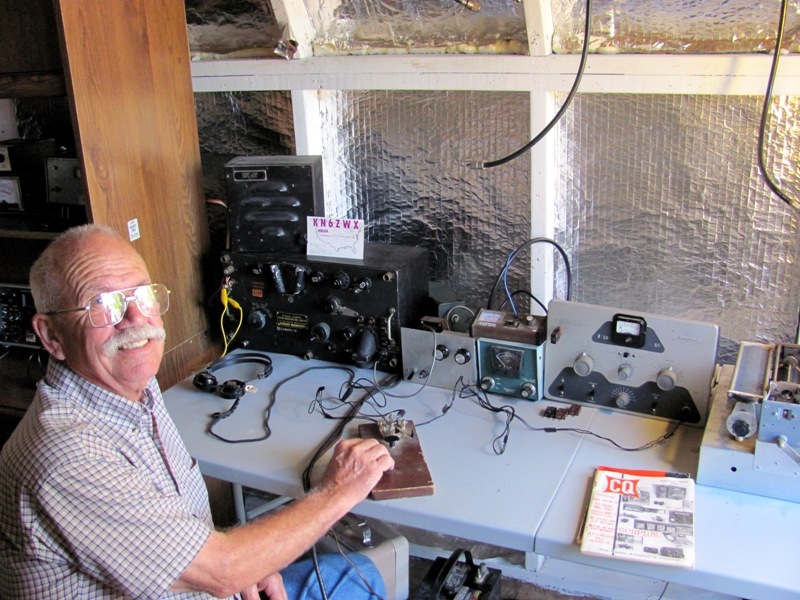 Norm was a member of ARRL (Life), AMSAT, QCWA, 10-10 International, the Northern California DX Club, the 3905 Century Club, North Hills Radio Club, Mt. Vaca Radio Club and the River City Amateur Radio Communications Society (Life). He was a staff writer for WorldRadio Magazine and was published in QST. A Celebration of Life will be planned within the next two months. Norm is survived by his daughter Kaayla Jaret KA6YLA. John, K7XE, says he is going to breakfast this Saturday, 26 November 2016, 9 am (or a little earlier), at The Waffle Shop, 2107 Feather River Blvd in Oroville, so the breakfast is on for all who can make it this Saturday after Thanksgiving. Happy Thanksgiving to all. There is a repeater being tested on 146.655 in the Laytonville area. To preserve our service area, I need to know if people are hearing it in and around Oroville. If members could monitor in carrier squelch and let me know if they are hearing it, and how strong it is, so this information can be used to mitigate any interference problems. If there is interference from this new repeater, and we do not take proper and immediate action, we will be stuck with the problem forever. The next meeting is Wednesday, December 14th. Lunch (or breakfast) is at eleven. (Denny's serves breakfast all day.) As usual, the group will be called to order at Noon in the meeting room. The program for this month will be part of TX Factor, Episode 13. The first section is on digital transceivers and the second is about weather and atmospheric conditions and how they affect propagation. The North Hills Radio Club had two fairly busy months. During our October meeting, we had the most successful White Elephant Sale we've had in a very long time. We also took nominations for election of officers which would take place the following month of November. During October we welcomed a new net manager and a new repeater trustee. Greg Bawolski, KK6WSP is our new net manager, succeeding Rick Fazzino, N6RIK, who moved out of state at the end of the month. Our thanks goes to Greg for being willing to take Rick's place. Greg is also the manager of our www.k6is.org. We invite all to log onto our site and see for yourself how much improved it is! Thanks to Rick, N6RIK for serving as net manager for the past four years. During October a new repeater trustee was appointed. His name is Ryan Larkin, amateur callsign W6RNL. He succeeds Glenn Mcclain, WA7SPY who has served for several years. Glenn asked to be relieved as trustee do to other things taking place in his life right now. Ryan has been under Glenn's wing for the past several years, with the thought being that he would one day become trustee. That day has come. Ryan's appointment as trustee became official on November 21. We would sincerely like to thank Glenn for serving as trustee for the past number of years. He quite litterally brought our K6IS repeater back from the dead! Glenn should also be thanked for installing IRLP, Internet Radio Linking Project to our K6IS repeater. We wish Glenn, who is a life member of our club, well in his future endeavors. We're sure that Ryan will be able to fill Glenn's shoes quite well. We wish Ryan the best of luck. In the coming weeks, Ryan will be adding EchoLink onto the repeater along with IRLP. Our IRLPp and soon-to-be EchoLink nodes are open to all licensed hams in the Sacramento area. During our November 15 meeting we held our election of officers. Kaayla Jaret, KA6YLA, is the new NHRC president. The out going president, Doug Emerson, N6NFF, drops down one rung of the ladder to vice-president. Our current secretary-treasurer, Maynard Wright, W6PAP, chose not to stand for re-election. Taking his place will be a young man by the name of Arren Jones, K6ABJ. He is the son of Stan Jones, N6ATS, who also is a member of nhrc. We welcome Paul Young, KA6PDY back to the board as a director. He will succeed Chris Gifford, KJ6LZR who, for health and personal reasons, chose not to run for another term. Thanks, little zipper wripper, for your service. We welcome Eric Handle to the board as a director. He'll take the seat being vacated by Kaayla in lieu of her elevation to the presidency. Two things about Kaayla. She is the daughter of Norm Brooks, K6FO who became a silent key recently. Kaayla is the forty-fifth president of The North Hills Radio Club. She is the first YL to become president of the NHRC. I know I speak for all members of the club when I say, "Good luck, Kaayla". Also, Thank you Maynard, for your many years of service to our club. Maynard has held all four offices of the club. One year, he held all four offices at once! The final activity of the year will be our annual Christmas dinner, to be held on Tuesday evening, December 13. We will meet from 6:00 until 8:00 P.M. at Brookfield's Restaurant in Sacramento. All who are members in good standing of the club are invited to attend. If you plan to come, don't be shy about bringing a guest along. As for me, I sincerely appreciate our club giving me the chance to serve as president for the past six years. I know that once the gavel has been passed to President Kaayla, she'll do a bang-up job as president. I'll do my dead level best to serve as VP. I've also enjoyed sending these articles to you, bad spelling and typos not withstanding. I don't know if Kaayla will want me to continue, do it herself or find someone else. So, thanks for reading. From all of us in the NHRC, have a very Merry Christmas and New Year. I'll see all NHRC members at our first meeting on Tuesday evening, January 17, 2017. The River City ARCS Membership Holiday Dinner will be held Tuesday December 6 from 6:00-9:00 pm at Sam's Hof Brau, 2500 Watt Ave, Sacramento, CA 95821 This is a Family Event! Current club members bring your family, guest or significant other for dinner, the Lyle Aufranc Award presentation, prize drawings and great company! If you wish to donate to our toy drive for needy children at WEAVE, please bring an unwrapped toy (up to $10 value) for collection at this Holiday Dinner Meeting. Thanks Carol, KP4MD for the interesting DX presentation at our November meeting. The Buddistick antenna’s performance vs the loop was informative. Congratulations to all the reelected Board, officers and our new president Ed, WA6QYO. I hope all the members continue to give their efforts to help the club be successful. In just a few days, our Christmas Party will be held at Sam’s Hof Brau. This will also be our December meeting so I hope to see all of you there. Watch out for door prizes, good fellowship, and a great meal - anything your heart desires (that is available at Sam’s and your wallet or credit card can handle). Our January meeting will be an Elmer night. Phil, KD6RM has organized the meeting where experts will be at tables helping those with specific questions. As my term ends, I would like to thank the Board for its help to bring interesting speakers to the meeting and ramroding our activities. Their efforts made my tenure easy and enjoyable. I plan to be at most of the activities next year, so you can’t get rid of me that easily! Now my quartet will not have to find a substitute violinist as often. For those continuing to follow my tower project, we installed conduit to hold transmission and control lines and 120V power. Then it rained. The trench filled with water and the conduit acted like a boat – it floated. I had driven in short pieces of rebar and wired the pipes down but the pipes pulled the rebar out of the ground! After a session with a sump pump and 4 yards of sand, it’s now time to pull lines and connect a carrier line for the bundle of cables to go into the house. Again, more calls to DX Engineering and trips to the electrical supply store and Home Depot. The project continues. We have made to the end of yet another year so it is time to PARTY! All members and their spouses are cordially invited to the Sierra Foothills Amateur Radio Club Annual Christmas Party, Saturday, December 10, starting at 6:00 PM in the Auburn Veterans Memorial Hall (100 East St., Auburn, CA). This is a potluck. The Club is bringing the turkey, ham, beverages, paper ware, decorations, and condiments. Please go to our website, www.w6ek.org, scroll down to Christmas Party and click sign-up to bring your favorite dish, dessert or hors d’oeuvre. We will have several Drawings, so bring cash! Second, will be the Club Drawing, you’ll want to make a cash donation for this one! The more tickets you buy, the better your chances are to WIN the Grand Prize, $300 Gift Certificate to Ham Radio Outlet!! There will be four (4) runner-up prizes of $50 each! New this year is a Food Drive Drawing. It is important that our Club offer assistance to those in our community that might need a little help to make the holiday season special. To that end, for each non-perishable food item you bring to the party, you will get one drawing ticket. The more you bring, the better your chances are. All items collected will be delivered to the Auburn Interfaith Food Closet. Please check out their website if you would like more information. So be sure to make a trip to the grocery store or raid your pantry before you come!! You’ll be putting a smile on someone’s face. I was remiss in mentioned our annual White Elephant Sale in last month’s Newsletter. It was another resounding success! Bob, K6UDA, and Tyghe, W6TGR, once again entertained and cajoled the money out of our wallets to the tune of over $700! The money gets allocated to the annual Christmas Party, see above. Thank you to everyone for bringing in their junk prized possessions for the good of all! We had a great time and I look forward to next year. November is election time at Sierra Foothills ARC. But first, I want to say a great big thank you to Al Martin, NI2U, and Birton, N6UG, for their service on the board this year. With their mentorship and never ending contributions to the club you were instrumental in keeping the wheels on the track as I fumbled my way through the first year. Thank you Gentlemen!! We have two new faces to the Board next year, Mike Perry, KK6GLP, and Greg, KO6TH. Mike will take over Al’s position as Vice President and Greg takes on Birton’s as Board member. Sharron, KK6RGV, will continue as our treasurer, Bruce, K6BAA, as secretary and Bob, K6UDA, and Andrew, KC6O, as board members. Thank you everyone for your service to the Club and I am excited for next year’s possibilities. Sharron, KK6RGV, has jumped forward to take on the Refreshment position next year from Laura and Scott Van Winkle. Thank you Laura and Scott for the goodies at our meetings! Also, thank you for hosting the Club Picnic and Christmas Party, see above!! Aaron, KG6TVT, one of our newest members and his sons Donald and Vernon, jumped right in to take over the Club Drawing from Jason, N6JDX. Jason had them all trained up by the end of the November meeting. Jason was instrumental in making our Hamfest drawing so successful by soliciting donations for all the fabulous prizes. Jason, thank you for all your help! We still need a Membership Chair. If you are interested, please let me know. I wish everyone safe and joyous Holidays!! Also, the membership dues for 2017 are due tonight. The amount is the same as it always has been – $24 for an individual, $36 for a family membership, and $12 for anyone under 18 or active duty military. We have never raised the dues in keeping with our goal of an affordable club. We have some interesting topics for the meeting tonight including solar power for stations and 2 meter SSB. This is a teaser – show up for more info. We have set the date for the 2017 Kickoff Party. It is Saturday January 21 2017 at the Via Roma restaurant in Rocklin. This year it will be a luncheon at 1:00 PM. More information will be shared at the meeting tonight and will be on the website soon (wparc.us). A variety of Italian food will be available and there will be a vegetarian option. The lunch will include a salad, main dish, dessert, and a soft drink. Other beverages are available but are not included. There is a change in the Board meeting dates. The meeting will now be prior to the regular club meeting on the third Tuesday of the month and will start at 5:45 PM. This will streamline the amount of time and money for Board members. This change will start in 2017. We did this with the November meeting and it worked very well. We have several weekly nets starting with the 2 meter System Fusion net on Monday nights at 8:30 PM. This net is growing rapidly and often goes to 11:00 PM with information sharing. Erik W6ETJ or LC N7VQC are the usual net controls. The next net is the Wednesday 2 meter net at 10:00 AM. Katy KJ6YCP is usually the net control. Thursday night we have 2 nets – the 2 meter net and the HF net. The 2 meter net starts at 7:30 PM and Dennis KI6HHA or Bill KJ6YCO are the usual net controls. I will have the net on December 29 and January 5th. 5 minutes following the 2 meter net is the HF net. LC N7VQC is the net control and has done a great job taking over for me while I am unable to raise my antenna. The HF band changes every week and the website has the frequency for the date. Jey KQ6DK is backing Clay K6AEP up on the website and is doing a great job with it. I have often mentioned that smile.amazon.com will donate a percent of your purchases to the ARRL. I have been participating in this program for quite a while and saw recently that Amazon has donated over $12,000 to the ARRL this year from ham purchases. That is a healthy infusion of cash and will support someone’s salary, new test equipment, or W1AW. I strongly encourage to enroll in the program if you shop at Amazon. It doesn’t cost you any money and does a lot of good. Tell your friends to enroll, too! Last month at the club meeting Erik W6ETJ discussed, among other things, the Elk Antennas 2M/440L5 Log Periodic Dual-Band Antenna. It is a compact, light weight, well-built antenna that has many uses and is very handy if you are into satellite or portable operations. I look forward to seeing you at the meeting tonight at 7:00 PM! WPARC conducts monthly club meetings on third Tuesdays of each month. Join us at Legends at Woodcreek Oaks Golf Club, 5880 Woodcreek Oaks Blvd., Roseville. WPARC Board meets on second Tuesdays at 7:00 PM, at Pizza Round Up, 2270 Nicolaus Rd, Lincoln. Members and guests with business to bring before the board are welcome to attend. The next general meeting will be December 6th at the Marysville First United Church, Pioneer Hall. The church is at the corner of 8th and D Street in Maryville. We will be having our Christmas Party and a catered dinner provided by Porky’s BBQ. Doors will open at 6:00 P.M. and dinner will start at 6:30 P.M. There will be door prizes with the grand prize of a generator. Hope to see you all there. 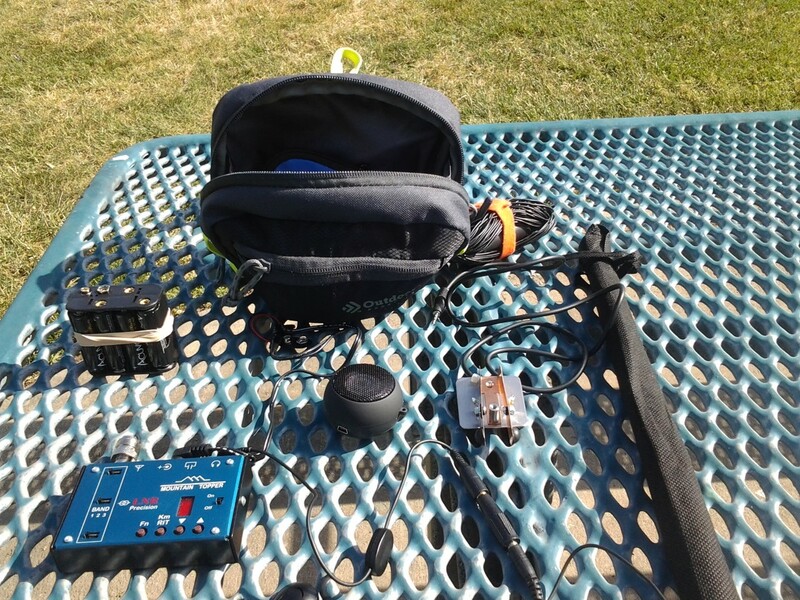 The W6SFM Samuel F Morse Radio Club November meeting was called to order by club President Mike, N6MQL on November 3rd at the Carmichael Presbyterian Church in Carmichael CA, with 10 members and 2 guest in attendance. SFM ARC President, Mike N6MQL read the Month's budget report and announced the current funds available. In lieu of club Secretary, Chris, AI6U. Mike also read the minutes of last month's in-person meeting and reported the totals for our W6SFM On-line/On-air net meetings for the month of October. In an effort to keep all of the clubs members who were either unavailable or out of state / city closely involved, The SFM ARC provided a LIVE FEED via our on-line LiveStream video services. This live feed can be found on the W6SFM.com homepage by clicking on the Live Feed! link at the top of our page. At one point there were as many as 12 people watching the meeting from their homes, cars, or where ever they had a smart-phone or computer available to them. For our first run the club used a simple, but effective iPhone 6 Plus as our way of videoing and broadcasting the in-person meeting. Of course with this being our first time there were a few lessons to be learned. The first being not to place the broadcasting device too close to the ventilation system in the room. It seems for the first part of the meeting the return air duct could be heard prominently. However, after a while that shut off and the audio proved to be very clear and easy to understand. A copy of the in-person meeting has been made available on our LiveStream account or by going to the W6SFM Live Feed! link on our homepage. To watch the meeting, or any of our pre-recorded videos simply click on the play button that says "Watch again". You can then scroll to select the video that you would like to watch. When the club is broadcasting LIVE it is required that you sign into LiveStream using a FREE account or your FaceBook username and password. Creating an account is very easy to do. Simply click on the "Join Livestream" link and follow the simple directions. All you need to have is a valid email address where your account can be verified. Topics of Discussion at our in-person meeting included the FCC Docket 16-239 where the FCC proposed to eliminate the current baud rate for data emissions, consistent with the ARRL's "symbol rate" petition. However, the FCC declined to propose a bandwidth limitation for the data emissions in the MF and HF bands. So it seems that the FCC agreed that there should be no Baud Rate restrictions on data modes, however, they disagreed that there should be a cap as to how much bandwidth the operator could use while transmitting. This is very similar to the SSB mode. It is a common mistake to assume that SSB transmissions are limited to only 2.8 KHz when in fact Part 97 makes no limitation to the legal bandwidth of a SSB transmission. Currently SSB transmissions are limited only by the manufactures of Ham radio equipment. These limitations are based mostly on older AM broadcast standards. The club was encouraged to submit comments in support of the ARRL proposal to limit bandwidth to no more than 2.8 khz. The club also discussed the new RM-1775 in which a Nevada ham is requesting that the FCC limit the frequency that a person can be issued a Vanity call. In preparation of The Semi-annual W6SFM Bug Roundup Event or "CQ BR" as it's also called the event details were discussed. More information on that event will be added to our Homepage, and to the section news next month. Other ARRL news and information was discussed at the meeting along with the current band conditions based on our own personal on-air experiences. Our next SFM ARC in-person meeting will be held at its normal time and address Dec. 1st (followed by our Jan. 5th meeting). The SFM ARC in-person meeting will be held in the Howard Crowley room upstairs at the Carmichael Presbyterian Church. More information including a Google Map is available on the homepage of our website. At our December meeting we will be discussing the outcome and participation of our November's Bug Roundup Event. We will also be discussing the upcoming North American QSO Party (NAQSP) event to be held in January. We will also be electing new club officers for the coming year. As usual, current events, News regarding Amateur radio and other ARRL items will be discussed. As always we will have our Tech (show and tell) portion where members and visitors are asked to share their Ham Radio related items they find of interest. Feel free to visit our In-Person meeting with items that you purchased or were given that you would like to share with the group. Visitors are always welcome to join us. Each Tuesday of the week 8:00 PM on 3.545 MHz the SFM ARC enjoys getting on the air with CW for our weekly Nets. You do NOT need to be a member of the SFM ARC to check into our nets and we encourage you to invite a friend to join us as well. Although our nets usually run around 13 wpm code, we are all happy to accommodate those that are slower and need us to oblige. If you are unable to copy Morse Code or need some code practice please feel free to visit our on-line LIVE streaming broadcast of both the Audio and a CW to Text decoding of the meeting. The “LIVE FEED” link can be found on our home page of our website. For those that would like to watch the Live Feed on their Apple IOS or Android devices a “LiveStream” App is required. For instructions and the proper location to view the LIVE FEED please contact Mike, N6MQL for more setup information. Do you or someone you know need a Ham Club to call home? For those that want to learn Morse Code, are interested in CW or already know and use it, the SFM ARC would love to be your new Club home. Our in-person meetings are held each 1st Thursday of the month at 7PM. The SFM ARC meets in the "Courtyard room" of the Carmichael Presbyterian Church in Carmichael, CA. The church is Located at 5645 Marconi Ave. For directions to the meeting visit our clubs home webpage www.w6sfm.com. Please use the rear parking lot and entry for best access to the meeting. A map and directions can also be found on the website. We hope to see you at our next meeting! Roughly 3-4 weeks after CQP finalized, a couple of QSL cards came rolling in. This was exciting enough by itself, because, being new to ham radio, QSL cards are exciting! It's like finding spare UHF connectors when you thought you were all out! And, I have heard that when you live in California, no one really sends you QSL cards... because everyone has already contacted California. We just aren't a hot commodity! So getting a few QSL cards was pretty cool, but one of them really stuck out. K4PBX had included with his card, a full page, typed request of how he was trying to get the Worked All Counties award, and that Alpine County was the last one he needed. He had also included a response card in case I didn't have a QSL card... which I don't. I put his letter on my desk as a reminder to send him a QSL card once I get some made... and there it sat. Roughly a month later, I get an email from K4PBX asking if I had received his letter. Again he reiterated that he was working on the Worked All Counties award. Because I was thinking so California centered, I was thinking there were only 58 counties, hold your horses, I will get a QSL card to you once I get some made. Well, it turns out, he was on a whole new level. He made mention of 3,076 counties that he has already confirmed and just needed the very last #3077. Then it dawned on me that I was immensely underestimating this kind stranger, and that something else WAY WAY more amazing than working all of California's Counties was going on. K4PBX was intentionally collecting every single county in the United States of America... all 3077 of them! I don't know how long he has been attempting it, but I immediately apologized for my laziness and sent his response confirmation card back. December 7th rolls around and I get a package on my doorstep. Upon opening it, I find a nice hand written thank you card, and a wooden plaque from K4PBX; a huge thank you gesture for helping him confirm his final county in the USA. This is my first "wallpaper" from being in the hobby. I hope it won't be my last. It is, so far, by far, the coolest thing I have gotten to do in ham radio. Thank you K4PBX! In 1957, I got my first ham license and had it for a year and let it lapse. I got back into ham radio in 1975. In the late 70's, I was listening to a pile up on a DX station in the South Pacific, when a very loud signal came on and made one call to the DX station. The DX station just said "WOW" what a signal. The station was W6BHM in Oroville, California, which was about 35 miles from me. He was sitting on a hill running an 8 element beam. Right then, I decided to make a big beam someday if we ever moved out of town. In 1984, we moved to the country on an acre and I started to collect antenna parts. I started to build the antenna in the late 80's and got on the air with it in the early 90's. After I got it built, I had it sitting on some sawhorses, two and a half feet off of the ground checking the SWR, when I heard it pile up on a station in Mexico City. So I pointed the beam that direction and made one call. I broke the pile up on the first call---Barefoot. I knew then that I would have a good antenna. After I got the antenna up, I would usually talk into the South Pacific and they often would tell me that I had the strongest signal on the West Coast. My friend Larry Murdock, K6AAW, who is on the DX honor roll, would tell me, "I would hear you talking to the South Pacific and I wouldn't be able to hear the station you were talking to"... The antenna is a 12 element, 10 meter mono band on a 60 foot boom. The boom is made out of 2 inch sprinkler pipe. The element were picked up from fellow hams, who had them. The antenna was put together with u-bolts with and hose clamps. The mast is 2 3/8th diameter tubing out of a gas well. The totor is an old prop pitch motor from a World War II aricraft. I got it from K6AAW and had it rewired. The tower is made from one inch schedule 40 balck pipe. It is 3 ft square and 42 feet tall up to the blatform. From there it is another 4 feet to where the first antenna is. The top beam is a Wilson 7 element beam on a 40 foot boom. The antennas were a lot of fun to build and use.